They are among his best, from his peak period 1945 – 1954, and they showcase all of his strengths, his style and his themes. All five also star Eva Henning, who was Ekman’s leading lady. They were also married until 1952. The theatre was almost as important for Ekman as filmmaking. He came from a theatre family (his father was the celebrated actor Gösta Ekman), he divided his time between the cinema and the theatre and he made several films with a theatre setting. Royal Rabble is even partly based upon Ekman’s own family, and their life in the theatre. So Royal Rabble is my first choice. The acting and the compassion with which all the various characters are portrayed is wonderful and while there is tragedy here it is primarily a love letter to the theatre, and all those people who are part of it. It was also the first film of his in which Henning played a role. The Girl from the Third Row is also centred around the theatre and it is a loosely structured film about multiple characters who accidentally cross paths. It is the film which Ekman called his “anti-Bergman film”, a direct response to Bergman’s Prison (1949). Henning plays the title role and the film moves effortlessly from tragedy to comedy to nail-biting suspense. There really is no other film quite like it. The Banquet is not about the world of the theatre but a tragedy about a wealthy family which is slowly unravelling. The father is tired and frustrated with life, his wife is living in denial about the problems they face, the older son is a decadent drunk, the younger son is a communist, disgusted by his family’s wealth, and the daughter (Eva Henning) is trapped in a wretched marriage (her husband is played by Ekman). With the imagery of a film noir, it is both a domestic horror film and a comment about a changing society after the war. Girl with Hyacinths is unequivocally Ekman’s most famous film; a feminist film as well as a key film within Queer cinema. It has a complex narrative structure and deals with a number of sensitive issues, including Sweden’s ambivalent role during the Second World War and its appeasement of the Nazis. It is beautifully shot by Göran Strindberg and the acting, especially Eva Henning, is fantastic. This too is a tragedy, and a very sad film. It was Ekman’s own favourite; he could barely talk about it without getting tears in his eyes. But Wandering with the Moon might be my personal favourite of all of Ekman’s films. Based on a novel by Walter Ljungquist, it is a lyrical tale of different people crossing paths during a few summer days. The spectre of Nazism is there, as a dark force in the shadows, but mostly it is a celebration of the loners and oddballs that live outside the mainstream of society. The main focus is on a young theatre actress (played by Henning) exploring her sexuality and an immature young man (played by Alf Kjellin) who has run away from home. Ekman’s films are almost always distinctly urban but this is an exception, and Gösta Roosling’s cinematography helps bring out the film’s lyrical aspect, with the sun and the moon glittering on the water or the leaves and the grass. Like Ekman’s other best films this is an open-ended and open-minded film, and a work of love. 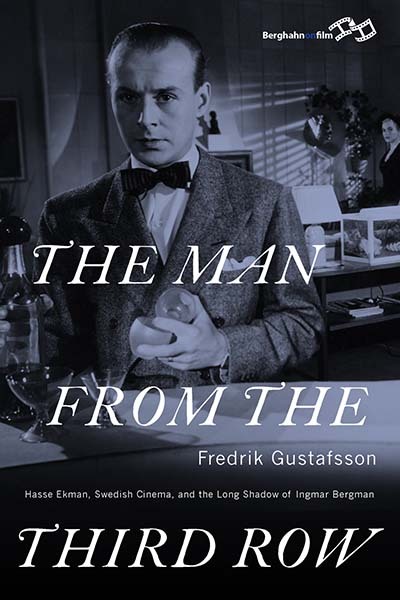 Learn more about Hasse Ekman with The Man from the Third Row: Hasse Ekman, Swedish Cinema and the Long Shadow of Ingmar Bergman by Fredrik Gustafsson. Fredrik Gustafsson has a PhD in cinema studies from the University of St Andrews. He has worked at the Ingmar Bergman Archives, and now teaches film history at Örebro University. He has programmed numerous Bergman retrospectives around the world and in 2015 he programmed Hasse Ekman: the Other Swede in the Room at the Museum of Modern Art in New York City. He writes regularly for La Furia Umana.